EGEE09 is underway! 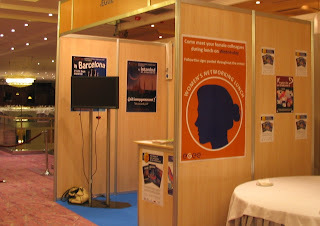 Registration started this evening and the exhibition area was a hive of activity with projects setting up their booths. Look out for the distinctive posters advertising the networking lunch on Wednesday. All welcome! Don't forget to fill in the 'Women in Science' postcards you'll find in your conference bags (handy pen provided). Drop them in at the EGEE booth, or post them back to us later if inspiration strikes you on the way home. Barcelona is certainly a lively place to be this week. The city fun run, Cursa de Merce took place today. If you bumped into hundreds of people in red shirts on the Metro today, that's where they were headed! Good job the huge storm we've just experienced this evening didn't strike earlier, with a downpour of 9 litres of water per square metre, that would definitely have taken the 'fun' out of 'fun run'. See you all in the Welcome Plenary tomorrow morning at 9!